We constantly endeavor to make high-quality Physical Therapy care accessible to you at prices that are friendly on your pocket. 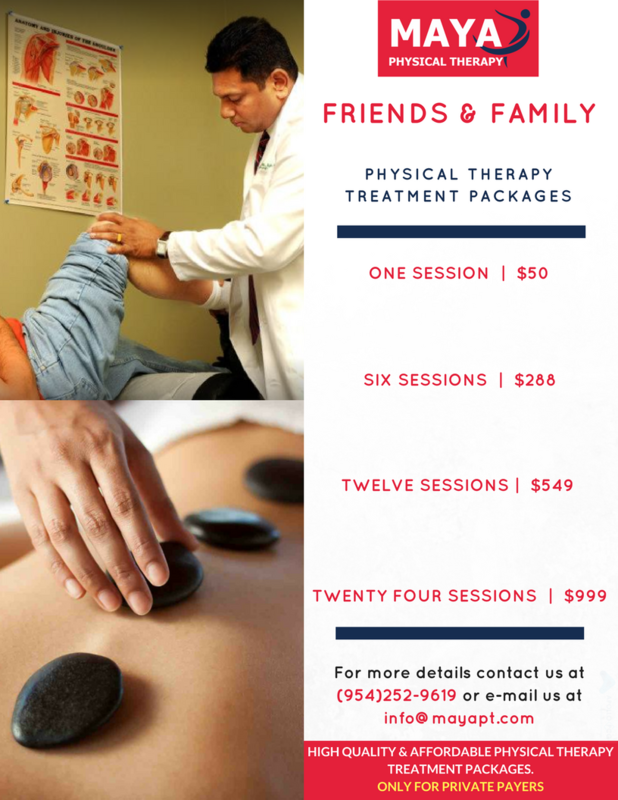 If you have a private insurance plan, then Physical Treatment has just become more affordable for you and your family at Maya Physical Therapy & Wellness Center. At a price starting from just $50 only! All you have to do is ask for the Package after visiting our clinic. What does the ‘Friends & Family’ treatment package include? Treatment packages shall be offered at our clinics in Davie and Pembroke Pines. Call us at Davie – (954)252-9619 or Pembroke Pines – (954)637-6370 to learn more and request for the package of your choice. Remember we accept more than 15 major private health insurance plans. Click here for the list of insurances we accept.